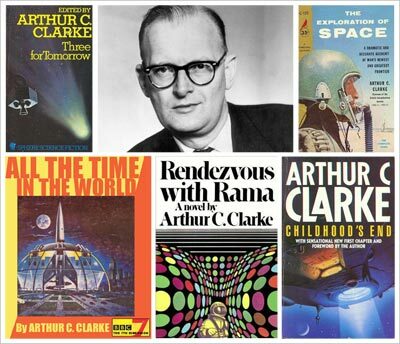 Science fiction great Arthur C. Clarke would have been 96 yesterday. Clarke lives on through his work and the revolutionary ideas he developed and championed with respect to science, particularly space. I wanted to take a minute to show Clarke some love. There’s never been anyone like him, and there never will be again — unless, that is, his spacebound DNA produces some interesting results. Clarke was born in Britain in 1917, but no amount of pub food or soccer could keep him there. The man had wanderlust that makes mine seem like more of an itch. Space called to Clarke, much as it did to Ray Bradbury, and he joined the British Interplanetary Society when he was only 17. Later he became chair of the group — twice. At a young age he distinguished himself from other scientists with his writing, and he distinguished himself from other writers with his knowledge of science. The two blended together in his work. Many of the concepts Clarke wrote about, such as the space elevator he described in his 1979 novel The Fountains of Paradise, and his thoughts about replicators, have provided food for thought, if not specific goals, for space engineers. 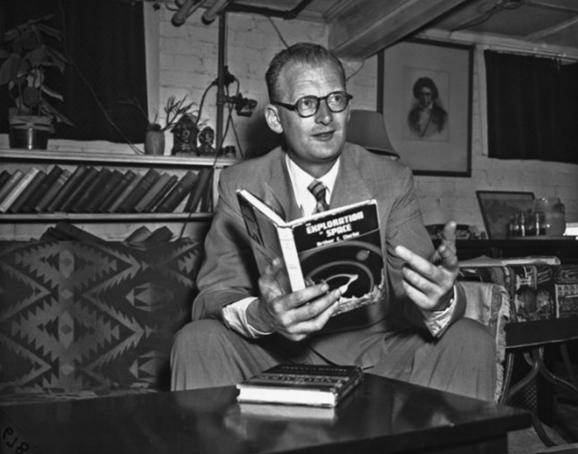 In 1945, Clarke wrote a paper advocating putting satellites in geostationary orbit. That’s right — you have Clarke to thank for your GPS systems and satellite TV. Eighteen years later, after America’s launch of the Syncom 2 satellite, Clarke won the Stuart Ballantine Medal, a science and engineering award, for the idea. Now most satellites hang out in an area called, appropriately, the Clarke Belt. In a nutshell, dude knew what was up, literally. Like many space enthusiasts, Clarke realized that the nearest accessible “alien world” is below, not above. He developed a passion for SCUBA diving, which brought him to Sri Lanka in 1956. Because he couldn’t even just SCUBA dive like an average human being, Clarke discovered underwater ruins of the Koneswaram temple of Trincomalee during one of his dives. The Hindu temple, built in 205 BC, was destroyed in 1600, and the ruins languished underwater until Clarke found them. His discovery prompted a wave of archaeological and historical interest in the site. Clarke also founded the Arthur Clarke Diving School, which I dearly wish I could have attended, but it was destroyed in a 2004 tsunami. Clarke fell in love with Sri Lanka and made his home there. He became a Buddhist, which provides an interesting spiritual depth to some of his works such as Childhood’s End. Later, he was given resident guest status. And then he was Knighted. Clarke’s sexual orientation is also noteworthy — he didn’t publicize it, but after a failed six-month marriage which was “incompatible from the beginning,” Clarke didn’t remarry or date other women. He had a Sri Lankan partner who he referred to as the “friend of a lifetime,” and those who knew him say there’s no doubt of his orientation. Though when journalists asked if he was gay, he’d simply say he was “mildly cheerful,” which is exactly the type of response one would expect from Clarke. The guy lived his life the way he wanted to, and with integrity — he didn’t make much ado about anything except his passion for writing and science. Clarke is perhaps best known for working with Stanley Kubrick on the screenplay for 2001: A Space Odyssey, based on a 1948 short story by Clarke called “The Sentinel.” Collaborating proved difficult, though, so Clarke finished the first draft of the novel 2001 in 1964, with publication plans just ahead of the film’s scheduled 1966 release. There were delays and other complications which ended up skewing the plan — the movie came out in 1968, which ended up being before the book. Clarke wasn’t a big fan of the movie, which he felt diverged too much from the book and downplayed his major ideas. As much as I love 2001, I don’t think it’s Clarke’s finest work. I reviewed Rendezvous with Rama over Thanksgiving, but his standout work in my opinion is Childhood’s End, inspired the TV show V and, which he nearly collaborated on with Kubrick instead of 2001. I’m glad things played out the way they did. Childhood’s End’s premise is gripping: one day, out of nowhere, huge alien ships appear over Earth’s major cities. They just sit there, and the people don’t know who or what is inside or what those creatures might want. The aliens, referred to as the Overlords, allow a single human ambassador to communicate with them through a one-way mirror, but they continue to remain mysterious. One of the first specific impacts they have on human society is to banish cruelty to animals — matadors begin hearing a high-pitched scream in their ears, and anyone who tries to harm an animal experiences the same. In this way, the Overlords usher in a Golden Age in which war, crime, poverty, etc. cease to exist. Yet the humans still don’t know who the Overlords are, what they look like, or what they want. Clarke’s build-up is masterful — even while the Overlords make what seem to be positive changes to human civilization, readers wait for the other shoe to drop. There’s just no way it can be that simple, and it’s not. But by the time the humans do get a glimpse of the Overlords and begin to discern their plan, it’s abundantly clear that the humans are outclassed on an epic level. But humans being humans, they resist. They don’t exactly fight back — immediately upon the Overlords’ appearance, the humans try to nuke one of their ships, which does no damage whatsoever and doesn’t even seem to irk the aliens — but they do get creative and eventually figure out what the Overlords are after. None of the many theories I had about the Overlords’ agenda were even close to right. The climax of the book is utterly unpredictable, and weaves in extinction, evolution, and spirituality (particularly the Hindu notion of Brahman). That’s all I’ll say. I’ve read this book five times, taught it three times, and given it to at least a dozen people to read. No one has been disappointed. Seriously, this is a book everyone should read. It’s science fiction at its absolute scientific and humanistic best. Although I agree that his books are fascinating and his stories extraordinary, Clarke just never understood humanity. To a point that often made reading his books rather annoying at times. His often rude comments about men with long hair or beards were particularly irritating. Not every man wants to look like him. He never understood this or cared to understand this. And in the video above, his comments about the city being useless once communications are better because the city is a meeting place proves once more how much he didn’t get it. As great as his stories were, I often turned to other writers who understood better. So, fascinating story teller, but terrible humanist.